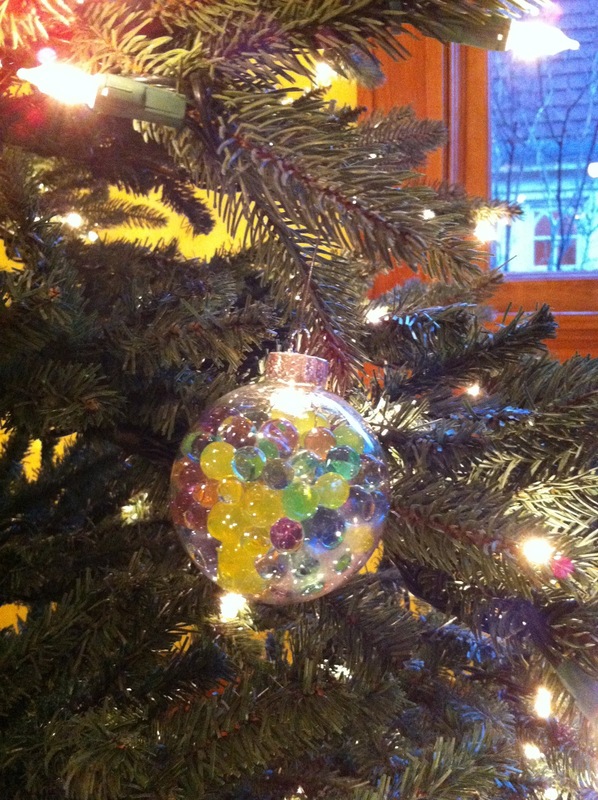 A few weeks ago I bought some clear plastic ball ornaments at the store. The ornaments came in a 6 pack and I honestly had no idea what we were going to do with them. A few days later while cleaning out a cupboard I came across two bottles of water beads, that we have had for a long time. 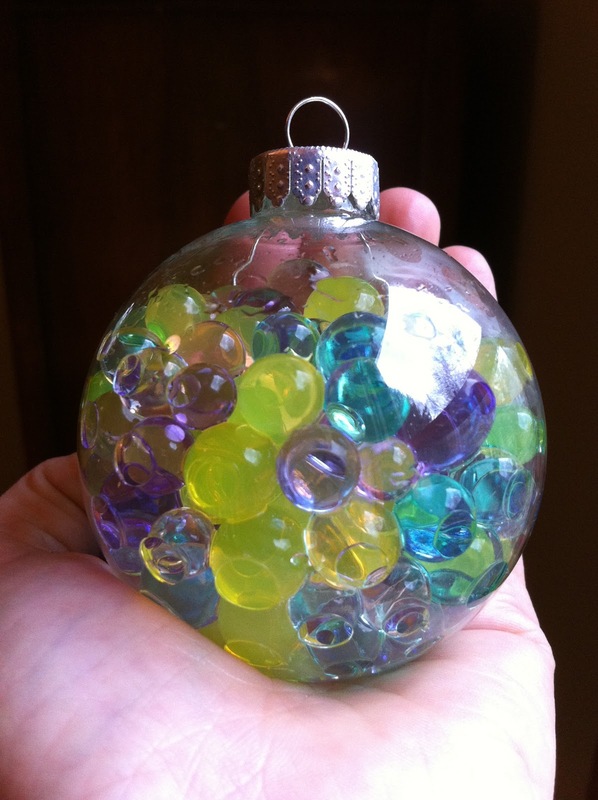 We haven't used the water beads in a while and they are so fun to play with and so cool to look at they seemed like the could be the perfect thing to fill our ornaments. I figured, at least if they didn't work we would have fun playing with them so I poured the water beads into a large bowl and gave the Bee one of the plastic ornaments to fill up. 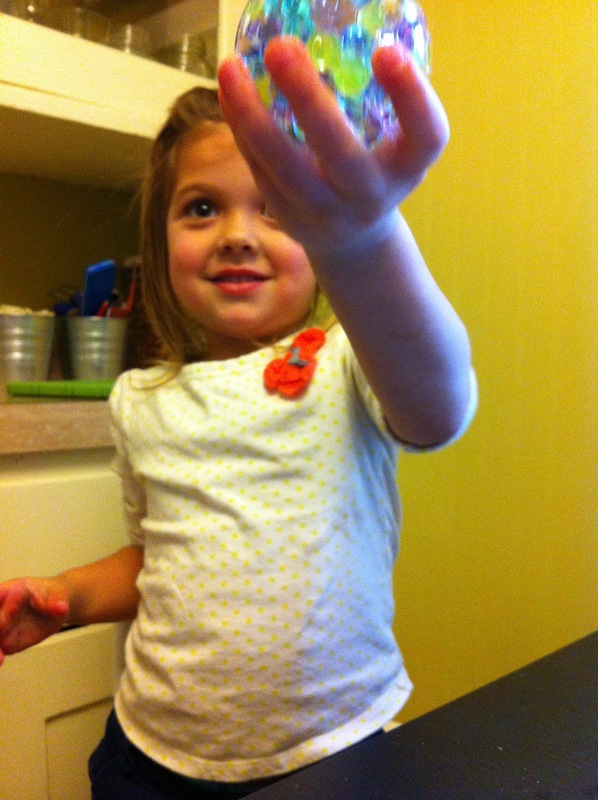 She was happy to play with the beads, which if you have never played with them are very hard to not play with. We quickly discovered that the easiest way to fill the ornaments was using our hands. 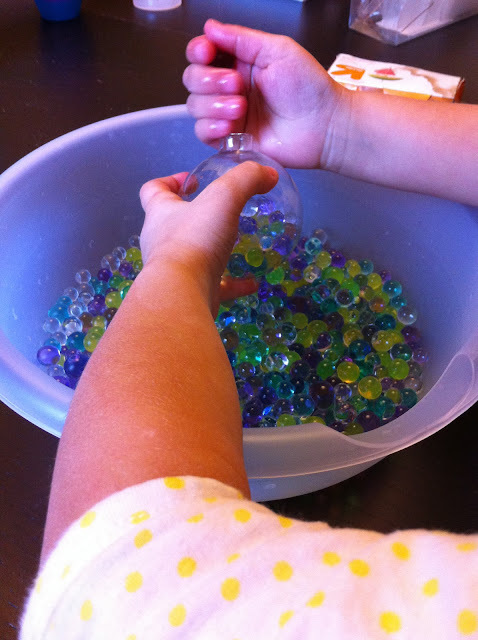 The plastic cups and spoons I had gotten out weren't much help and took away from the fun of playing with the beads. It really just took us about 15 minutes to fill all the ornaments. When we were done I attached hooks and hung the ornaments on our Christmas tree while the Bee, at this point accompanied by the Bean who had woken from her nap, finished playing with the beads. After about 20 minutes the ornaments started to get a little cloudy with condensation but by the next morning they seemed to clear. Over the last few days I have seen them get a little condensation on the inside but a little shake seems to clear it away. 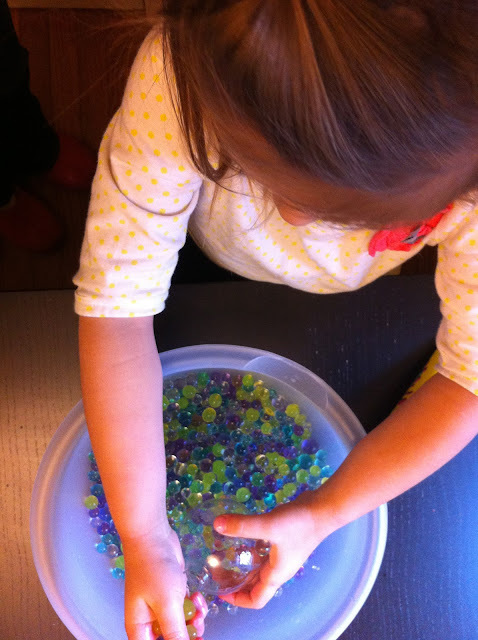 I am not sure if the water beads will start to dry out in there or not, I guess it will be a little experiment for us to observe. If they did we could always add a little water to bring them back. The finished ornaments look beautiful. The water beads gleam in the lights from the tree and shimmer as if they were colorful glass. Not to mention how proudly the Bee has been pointing them out and letting people know that she made them by herself.